It’s a Milk Bar Monday, folks, and I couldn’t be more tickled pink than to have it coincide with my Lil Sis’s birthday. A whopping 26 years old (cough), Lil Sis is one of my favorite people on the planet, and a very dear friend. She massages my weary, arthritis-laden body when I’m sore (awesome having a massage therapist in the family), gave me my first lessons in pasta making in preparation for my upcoming Easy Eats magazine feature, Mitra runs up to her full of love, and she’s instrumental in helping me cope through those big, life-changing moments we all love to fear so much. Lil Sis claims to be moving to Virginia or North Carolina or something like that in May. I choose to remain in a state of denial. On top of being a truly loving, creative person, Lil Sis has somewhat recently started a gluten-free diet. I had this CRAZY layer cake to make for this round of Milk Bar Mondays, where a small group of incredible lady bloggers bake out of Christina Tosi’s Milk Bar cookbook. I’m the alternative baker of the bunch, and was immediately sold on the awesomeness of the swap when my Carrot Cake Truffles were quickly hailed as one of the best things I have ever made. Host Nicole at Sweet Peony has the whole recipe too! Follow the Milk Bar Monday ladies on Twitter! Follow the Milk Bar Monday board on Pinterest! Now, this cake is a little insane. 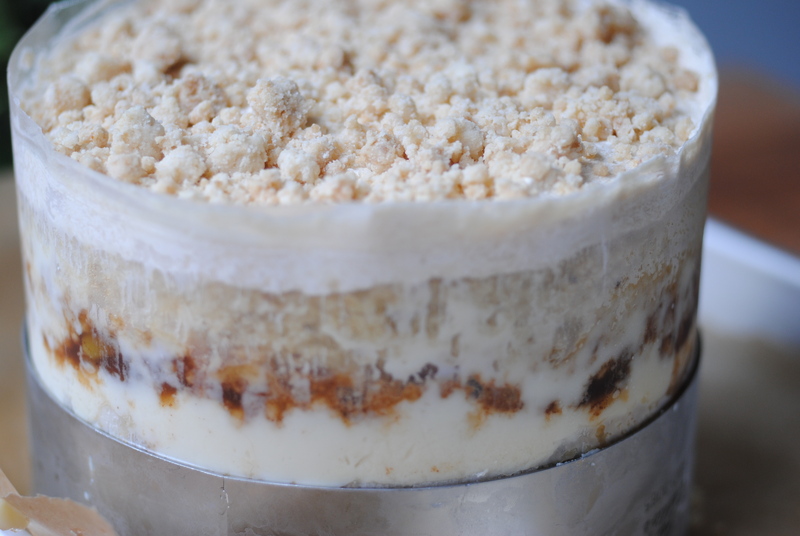 A brown butter cake layered with Liquid Cheesecake, Apple Pie filling, Pie Crumb and Apple Cider Soak, then topped with Pie Crumb frosting. Tosi might be a bit insane, but she’s a genius. There were layers of “wow” going through my family as we all tasted, it being proclaimed an incredible combination of coffee cake and apple pie. It is extremely sweet. If I ever make it again I’ll cut some of the sugar from the apple pie filling and cheesecake, because it’ll still be plenty sweet with a little omission. But it is ridiculously, amazingly, scarily delicious. Don’t be afraid of the many steps – it comes together brilliantly. Just plan ahead a bit (I made most of the components in one day then made the cake and built and freezed it a second), and it makes a stunning presentation. Happy Birthday Lil Sis. I love you up to heaven, down to earth. My version is gluten free, and while I used butter in the cake itself it can be made dairy free as well by substituting the brown butter with melted Earth Balance. Adapting Tosi’s recipe to be gluten free didn’t work, as there was far too much fat and gluten-free flours can be heavier than all-purpose wheat. So I made my basic vanilla cake with brown butter instead, and got the same taste results with a better texture. The key to this cake is making sure that the oven is hot, the ingredients are all at room-temperature or warm, and that you whip the eggs to at least twice their size before folding in the rest of the ingredients. This way you get an incredibly spongey cake that’s full of flavor and doesn’t risk sinking when you take it out of the oven. Use the cake round to gently cut 2 circles of cake from the pan. Place cake ring on a piece of parchment on a sheet pan. Insert one of the strips of acetate securely into the ring. Pile the scraps of cake cut around the circles into the bottom of the cake ring and use your hands or the bottom of a glass to press into a flat layer. Wash the cake layer with a healthy dose of the Apple Cider Soak, about 1/2 of the recipe. Use a spoon to evenly spread 1/2 of the Liquid Cheesecake on the layer. Spread 1/3 of the pie crumbs, pressing them into place. Spread 1/2 of the apple pie filling as equally as possible over the crumbs (for a firm cake, don’t use the more liquidy part of the filling). Gently insert the 2nd ring of acetate, overlapping about 1/4 of an inch to make an almost 6-inch ring. Gently place one of the rounds of cake in the ring, and repeat with equal amounts of filling. Top with second round of cake, and frost completely with Pie Crumb frosting. Sprinkle with remaining pie crumbs. Preheat oven to 350 degrees. Line a quarter-sheet pan with parchment paper and do not grease the edges. If using butter, makes it all deliciously brown and nutty by microwaving it in a heat-proof bowl (Pyrex is great) closed with a heat-safe plate for 6 minutes. You’ll hear the butter bubble and pop, and it should be dark and golden when you (carefully) remove the plate. If it’s melted but still yellow, nuke it for another minute or so. If using Earth Balance, simply melt it over the microwave or on the stove until thoroughly melted. Either way, allow the melted fat to cool while you prep the rest of your ingredients. Weight our your dry ingredients into a medium bowl. Prep a standing mixer with the whisk attachment. In a double boiler over simmering water, whisk the eggs and sugar until the sugar is completely melted and the mixture is slightly above body temperature (do not let the egg cook, you’re just warming them so that they whip up more easily). Immediately pour into standing mixer and begin whipping on medium/high-speed until the mixture more than doubles in size and becomes light and fluffy. Add the vanilla and beat until incorporated. Remove from mixer, and fold in flour mixture. Immediately pour into pan and bake for 30-38 minutes or until a toothpick in the center of the cake comes out clean. Cool completely before building the cake. Whisk together 1/4 cup apple cider, 1 tsp tightly packed light brown sugar and a pinch of cinnamon until the sugar is dissolved. Fill a bowl with cold water and add lemon juice to it. Peel the apples, then half and quarter them. Remove the core, then cut each piece lengthwise into thirds and crosswise into fourths, so that you have 12 small pieces from each apple quarter. Move them to the lemon water to keep them fresh while you cut. When all the apples are ready to go, strain them and toss them into a small pot with the rest of the ingredients. Put on medium heat and bring up to a boil. Cook for 3-5 minutes, until the apple are soft but not getting mushy. Heat oven to 350 degrees. Line a half-sheet pan with parchment or a Silpat. Combine flours, gum, sugar and salt in bowl of a standing mixer with paddle attachment and paddle on low-speed until well mixed. Add the butter and water and paddle on low-speed until mixture starts to come into crumbles. Pour onto baking sheet and bake for 25 minutes, checking them occasionally to break them up. The crumbles should be golden brown but not hard – they’ll seem to crumble when you press on them, but as they cool they’ll harden a bit. Let the crumbs cool completely before using for the cake (you’ll use half the recipe for the frosting and the other half for the layered cake). This makes enough for 2 cakes but Tosi says it’s really hard to make a single serving, so make double and use the rest for snacking or cake-truffle-ing! Combine crumbs, milk and salt in a blender and blend for about 3 minutes on medium/high-speed until it’s smooth and homogenous. Scrape under the blade halfway through to make sure the entire recipe mixes completely. In a standing mixer with the paddle attachment, begin paddling the Earth Balance / butter and confectioners sugar until fluffy and pale, about 2-3 minutes on medium/high-speed. Scrape down the sides with a spatula. On low-speed, paddle in the milk mixture. After a minute, bring up to high-speed and whip for another 2 minutes. If mixture is not fully uniform, very pale and fluffy, scrape the bowl again and paddle for another minute. Use immediately, or store in fridge for up to one week in an airtight container.